According to Jason Epstein of San Francisco, The Amazing Meeting in Las Vegas isn't really a science education conference. “It's an exercise in sleep deprivation,” said Epstein, 35. He's a former Japanese-to-English translator, starts med school in August and just last week attended his fifth Amazing Meeting of scientific skeptics. Skeptics confront harmful misinformation, such as medical quackery and financial swindles, as well as sillier subjects like UFO encounters. Skeptics brush up against supernatural claim makers, like psychics, as well as more sinister ones like Holocaust deniers. In all situations, they promote critical thinking and scientific literacy. 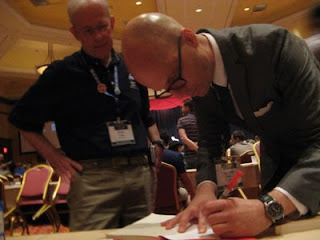 Skeptical rock-and-roller George Hrab signs an autograph for Brian Engler of Burke, Va. at The Amazing Meeting 7 in Las Vegas. The Amazing Meeting, known as TAM, is the largest annual meeting of skeptics. They attend lectures from famous science popularizers like Michael Shermer, as well as take in the bars, restaurants and shows Las Vegas offers, although few skeptics seem to spend much time actually gambling. Skeptics like Epstein say that the real fun of TAM is meeting other skeptics and interacting with them. “It's a week-long party with 1,000 of my closest friends,” said Epstein. “Sometimes the conference gets in the way.” The conference officially started Friday, July 10, but he arrived in Las Vegas a few days before to spend more time with fellow skeptics. Some skeptics enjoy booze-soaked conversations over cluttered bar tables while others never touch the stuff and share intellectual exchanges late into the night. Linda Shallenberger, administrative director of the James Randi Educational Foundation, the nonprofit group which puts The Amazing Meeting on each year, said the organizers are fully aware that social interactions are the real draw for TAM attendees. “We have no problem with that,” said Shallenberger. She said it's good that the skeptical movement has a place to gather each year as a community. Prairie, treasurer of the Association for Rational Thought in Cincinnati, Ohio, said he also felt encouraged by the steady increase in attendance each year. The official attendance count for this years TAM was 1,007, according to Jeff Wagg, outreach and communications manager for the James Randi Educational Foundation. He said in addition to being the biggest TAM, this year had the highest satisfaction rating from attendees. Wagg said the first TAM in 2003 drew about 125 people and has been growing each year. 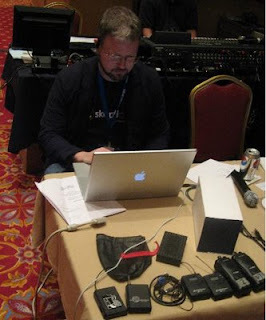 In 2008 TAM 6 had around 900 skeptics in attendance. 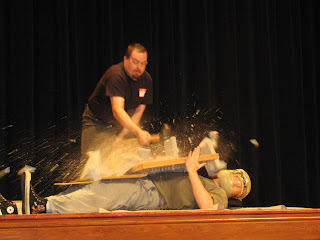 Andrew Gould, of Canberra, Australia, smashes a cinder block on top of high school science teacher Matt Lowry, who is masked and wedged between two nail boards. Lowry, who was unharmed, said he has been doing this demonstration for his students for the past 10 years. New this year was a one-day medical conference co-produced by the James Randi Educational Foundation and Dr. Steven Novella. Novella, who founded the anti-quackery blog Science-Based Medicine at the beginning of 2008, is also the host of the Skeptics' Guide to the Universe podcast and president of the New England Skeptical Society, as well as a clinical neurologist and associate professor at Yale. The Science-Based Medicine Conference counted as six hours of category one Continuing Medical Education credits for registered physicians who attended. Speakers at the Science-Based Medicine conference, all of them medical doctors and bloggers on the site, spoke about the dangers and prevalence of medical misinformation. Speaking at the podium, Novella said medical misinformation movements, most under the banner of “alternative medicine,” are a hodge-podge of opposing viewpoints and explanations that contradict one another. The Science-Based Medicine Conference was held on Thursday, July 9, the day before the official start of TAM, but at the same time as two of the optional TAM workshops. “Since it was all day, we had no choice but to do them at the same time,” said organizer Jeff Wagg. He said the simultaneous scheduling drew some complaints. Neurologist, podcaster and skeptical blogger Dr. Steven Novella speaks about the critical differences between evidence-based medicine and science-based medicine. Novella said science-based medicine rejects flawed studies and uses logic and reason in selecting treatments. The conference had two days of speakers, including Bill Prady, executive producer of the nerdy sitcom The Big Bang Theory, molecular medicine expert Dr. Fintan Steele and skeptical magicians Penn & Teller. During a question and answer session of a live taping of the Skeptics' Guide to the Universe, podcaster Rebecca Watson received a staged wedding proposal from her boyfriend Sid Rodrigues, leader of the London Skeptics in the Pub social group. The two were immediately married on stage in a legal ceremony. He was originally slated to perform a magic act, but an unnamed medical procedure left him too weak. Attendees were asked not to shake hands with Randi to avoid contamination. “I don't want to catch anything, and I don't want you to catch anything,” said Randi while on stage. 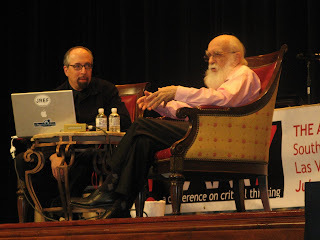 From left: Magicians Jamy Ian Swiss and James “The Amazing Randi” Randi discuss the concept of “half-smart;” people who are easily fooled because they get cocky. Sunday, July 12, was the final day of TAM 7 and after six individual half-hour presentations on various skeptical topics, there was challenge to claim $1 million from Randi. The contestant, Connie Sonne, claimed she could prove she has supernatural powers by reading numbers written inside a sealed envelopes by dowsing. Sonne was just the latest contestant to apply for Randi's million dollar challenge. The test is always conducted in a carefully-controlled environment to rule out both chance and trickery. Contestants agree ahead of time that the rules of the challenge are fair, and no one has ever passed the test. Randi, who has a long career of trickery-detecting, has used his knowledge of deception and sleight of hand to make sure the only way anyone will win the prize money is if they demonstrate a real supernatural talent. Sonne went back home to Denmark empty-handed, but skeptics were energized that the million dollar challenge is back on the table. Randi said he started the challenge as a way to reference how unsuccessful paranormal claim makers are when carefully tested. The challenge was retired recently because Randi's staff was only getting applications from the mentally ill and deranged and in high volumes, but Randi announced at TAM 7 that they have decided it's worth keeping on the table. “The million dollar challenge is a hammer,” said Phil Plait, the president of the James Randi Educational Foundation. He said it's an excellent tool to show that paranormal claims are bogus. The money set aside for the prize was donated anonymously, and the same donor also provided the building in Fort Lauderdale where Randi's foundation is based. Joe Nickell, skeptical paranormal investigator, signs the scrapbook of Jennifer Young, 32, of Midlothian, Va. at The Amazing Meeting 7 in Las Vegas. Jones Hamilton, 55, of Huntsville Ala., returned this year for his seventh TAM. He's been to all the TAMs except for the small TAM 5.5 held in January 2008 to bridge the long gap when the event was moved from the winter to the summer between TAM 5 and TAM 6. Eran Segev, president of the Australian Skeptics, said he's been wanting to go since he heard about TAM 3 but didn't get a chance until this year. He said after his 20-hour plane ride it wasn't what he expected. 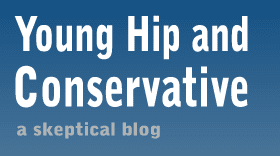 “It's better,” said Segev, who also appears on the Skeptic Zone podcast. He said TAM isn't all fun, as some of the serious skeptical players he's talked to have full schedules of meetings and recording interviews, and no time for attending lectures and socializing. Ed Baehr, 57, of Bayville N.Y., is a dedicated TAM goer. He volunteers to work behind the official merchandise and book table each year. “I enjoy it, it's like being on the inside,” said Baehr. “It's not so much face time with the celebrities I like, it's the community aspect.” He has attended all the TAMs, including TAM 5.5. “I have a very understanding wife,” he added. The assembled Science-Based Medicine Conference speakers. 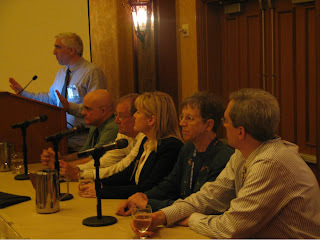 From left: Steven Novella, Kimball Atwood, Mark Crislip, Val Jones, Harriet Hall and David H. Gorski. In addition, Baehr was one of about 80 people who attended the fund-raising convention Randi held a few years before the first TAM that ended up losing money because of low attendance. Jeff Wagg, the TAM organizer from the James Randi Educational Foundation, said all of the TAMs have made money, except for the small TAM 5.5 which broke even. Wagg, who was highly visible running up and down the conference aisles with a black ear piece and a pair of Ecco high-impact dress shoes, was responsible for everything from overseeing the stage production to the height of microphone stands. “I'm kind of the advanced guard,” said Wagg. “I come in first and leave last.” Wagg arrived the Saturday before TAM and didn't finish until the Monday after. Wagg said TAM costs more than most conferences, full attendance costs a few hundred dollars at minimum, because it lacks corporate sponsorship, with the exception of a grant from the John W. Carson Foundation. “Most of the expense is food,” said Wagg. TAM attendees are treated to two meals each day of the conference and a single evening reception the night before it starts. Wagg said speakers are provided with travel expenses and a place to stay, but are rarely paid. Wagg said it's too early to know how much money TAM 7 generated. Although the Internet has helped the skeptical community grow exponentially in the last decade, the tough economy had the potential to decrease attendance this year and skeptics weren't sure which direction attendance would go. He said organizers planned to make sure TAM wouldn't lose money if attendance was as low as 600. “TAMsters rhyme with hamsters, and anything associated with hamsters is good,” joked Wagg. Linda Shallenberger from the James Randi Educational Foundation said the 1,000-strong attendance record was much higher than they expected. She said TAM is the largest fund-raiser the foundation does each year. Other sources of revenue include private donations, Randi's speaking fees and interest from the $1 million prize money. “That has not been as good a source as in the past years,” said Shallenberger. She said the foundation has an annual budget of about $700,000 and spends most of it hosting its website, paying personnel costs and providing college scholarships.